Count on our expert team of roofing contractors to step in when you’re having roof issues in need of repair! There’s never a good time to realize that there’s damage to your home’s roof, and all too often it seems to surface when bad weather hits. But you don’t have to sustain further damage if you act quickly. Pick up the phone and call Burell Built Exteriors. We’re available 24/7 for emergency service, and will quickly send a skilled contractor out to inspect the damage and recommend the best course of action to secure your home once again for you and your family. Contact us at (865) 385-6926 for a roof repair assessment for your Knoxville, TN home. For Chattanooga, TN roof repair, call (423) 702-4042. Roof leaks can be caused by many different things. Sudden storm or hail damage, trees and debris falling onto the roof, worn out or sun-damaged shingles, and people walking on the roof can all cause issues. (And that’s just a partial list of factors than can create damage.) And yet, 90% of roof leaks are eventually traced back to poor installation or defective flashing. Roof products themselves are pretty reliable, especially materials from the great manufacturers and local suppliers that we regularly use on our own jobs. But we often discover improperly secured shingles or flashing that was never sealed well or has been left to wear and crack over time, and these issues can cause significant damage to your home’s structure when left for years at a time. At the first sign of problems, and certainly if you see an active leak, call our team of manufacturer-certified professionals to come out and inspect the issue. 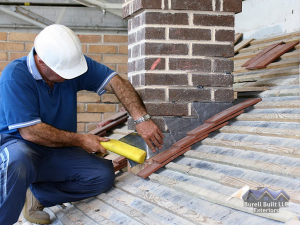 Because we understand the whole range of roofing and exterior services, we will carefully evaluate all aspects of your roof to find the source of the damage. During our inspection, we can also help you identify areas of wear or vulnerability that we recommend addressing before they lead to bigger, more costly repairs. One of the most effective ways that you as a homeowner can secure the integrity and performance of your roof is to regularly inspect it. Spring is a great time to take a peek at the condition of your roof. The pleasant temperatures make an exterior inspection more favorable, but you’re also taking action and surveying the current condition before spring storms hit. 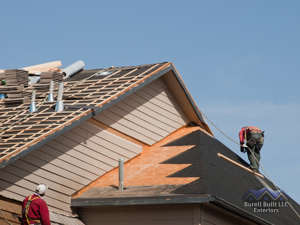 You can also call in the team at Burell Built Exteriors to perform your regular roof inspections. We’ll happily climb the ladder and thoroughly assess all aspects of your roof, chimney, flushing, vents, gutters, fascia, etc. Our fair weather in Tennessee provides year-round opportunities for replacement or repairs, so you don’t have to wait for damage to get ahead of issues, many of which are easier and cheaper to address before you introduce the elements. Call us for a free roof repair analysis for your Knoxville or Chattanooga home! Updated on September 16, 2016 at 2:32 pm by Burell Built Exteriors.